Dr. Kuzhalmannam Gopalakrishnan Ramakrishnan, popularly known by the name of his birth place in Palakkad ‘Kuzhalmannam’, had his early lessons on Mridangam at the age of 5 from his father Shri. Gopalakrishna Iyer. 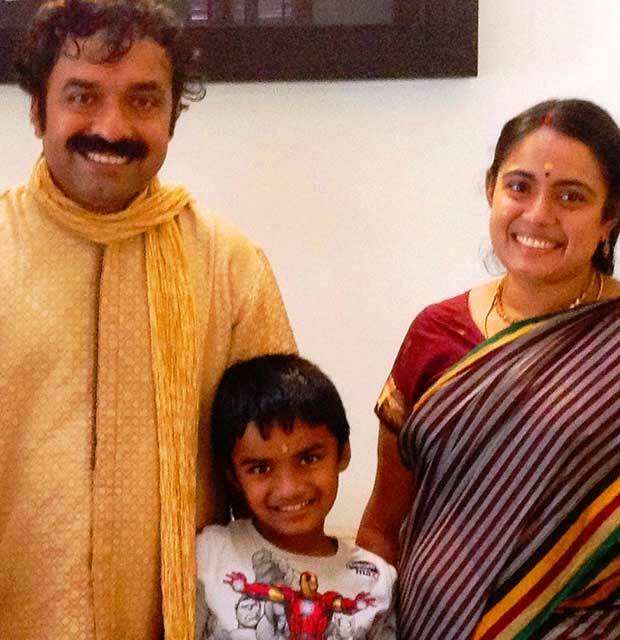 It took about 5 years to turn him a beginner, accompanying with carnatic musical concerts and noteably for few eminent personalities at a very young age. Looking back the long career over 3 decades and thousands of concerts owing him several proud moments witnessed by his audience and music lovers, Kuzhalmannam Ramakrishnan still continuing his efforts in self-refining his percussion skills in Mridangam performance that offers a great experience to his audience and is appreciated by legend vocalists, co-artists and music lovers all along his career history across India. 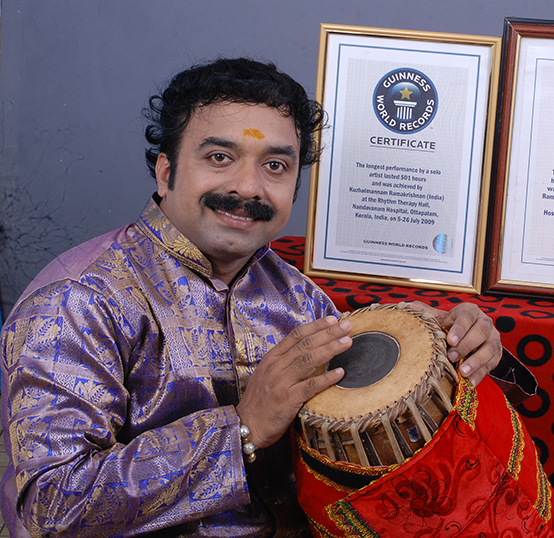 Between 2004-09, his repeated attempts in surpassing existing & setting new world record brought him to limelight, scribing his name 4 times in Guinness Book of World Records & Limca Book of World Records for non-stop solo performance under the category of hand-drum and bringing international fame to ancient Indian musical instrument. The most recent world record of 501 Hours of marathon performance in 21 days also helped him to attain him two records, Guinness World Record in Longest Solo Concert & Hand-drum Marathon. In July 2004, by surpassing the existing record with 36 hours of continuous Mridangam performance was done for Cancer awareness message. In May 2005, at an event in Kannur, with 101 hours non-stop Mridangam solo, ‘Rhythm for Peace’ aimed at disseminating the message of anti-violence. In August 2008, a solo concert for 301 hours perfromed at Nehru College Campus, Coimbatore to popularize Indian Rhythm and Mridangam among the youth. Finally, in July 2009, The Enchanting 501 hours non-stop performance - ‘Rhythm Therapy’ at Nandavanam Hospital, Ottapalam, to experiment the effect of rhythm as an alternative therapy. Besides all, being a multi-talented and as his mural paintings aimed towards social change & peace, his world records achievements too aligns to same line of thoughts. In making his dream a reality after about 8 years of thought process and experiments, a new version ‘Mridu’ was invented in 2013 involving modern approaches to reduce the weight and improve the convenience to users while preserving the authentic & mesmerizing tones of this special ancient music instrument. ‘Mridu Tharang’ was one more step ahead for fusion performance, which was very well received in various performances including in overseas. Few noteable concerts were are; International Trade Fair at New Delhi, Malabar Mahotsav, Naada Neerajanam at Thirupati, and World Tour of Soorya-India Festival in various Middle-East Countries. A complete facelift was given in 2015 and is known by ‘Sadh-mridangam’ which completely replaces usage of wood, thus by making the instrument environment friendly and weighs less than 5kg. The instrument can also dismantled in to 3 parts and more flexible compared to traditional instrument in terms of setting and changing the sruthi with specially made arrangements. At the age of 28 he secured his position as A-Grade artist by All India Radio & Doordarshan judging panel and from Prasar Barathi for the highest recognition ‘The Top Grade’ in 2010. Other noteable participations including popular musical shows like ‘Radio Sangeeth Sammelan’ by All India Radio, National Programmes conducted by Doordarshan, Live National programme from Sree Thyagaraja Festival Thiruvaiyaru, and famous reality show ‘Idea Star Singer’ by Asianet. Two of his works related to music in film industry was also well received. A tele-film ‘Naadam’ which highlights the effects of mridangam tone in humans is of much importance considering the thought processes and learnings involved behind. The other work is a movie, released in theaters where Dr.Kuzhalmannam Ramakrishnan handled the lead role, lyrics and music composition. The movie is also more music & art centric. 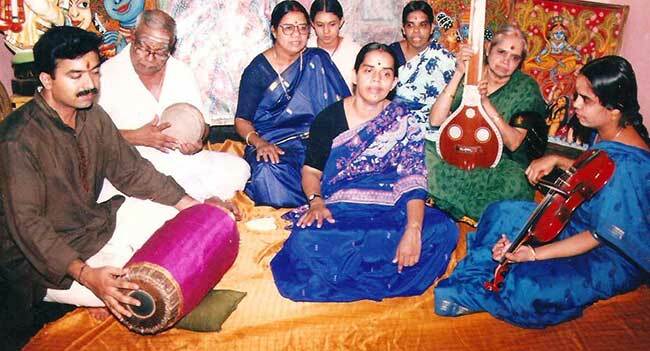 Kuzhalmannam Centre of Music & Arts is his initiative in 2006 & is the founder aiming to promote art & culture. The institution affiliated to Kerala Sangeetha Nataka Academy, where hundreds of young students aspiring in music and art are trained here in different types of music instruments, craft, mural paintings and dance. ‘Kalashree’ 2013 award of Kerala Sangeetha Nataka Akademi. In addition to the above titles / awards he has been honored with Honorary Degree of 'Doctor in Record Breaking', Honoris Causa for "Longest Solo performance- Hand Drum" by World Records University.